I’d just been through a spell of reading a bunch of books in a row that were all the same, with a few exceptions here and there, but finding myself without anything to say. I wanted to read something that was different from what I had been reading, something that would challenge me, other than Middlemarch (progress since last Middlemarch mention being more or less exactly equal to zero). So I turned to a book that I’ve had for a while which I was a little afraid to read, because when I first picked it up and read the first chapter, I was overwhelmed with the feeling that the book was going to be sad, and set it aside. I wasn’t wrong. 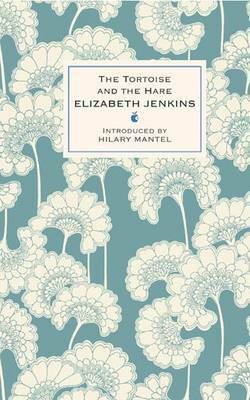 Elizabeth Jenkins’s The Tortoise and the Hare is one of the saddest beautiful books I’ve ever read. Set in the early 1950s, The Tortoise and the Hare is the story of an unhappy marriage – the story of its slow but (to my mind) certain disintegration. Evelyn Gresham is a successful barrister working in London, who at each weekend comes out to the country to his young, beautiful wife, Imogen, and their son. Imogen is some years younger than Evelyn, and her whole married life has been consumed with ensuring her husband’s happiness – or if not his happiness, at least the absence of disruption in his limited leisure time. We soon see that Evelyn seems not to appreciate Imogen, or any of her efforts on his behalf. Their son, also, does not respect Imogen, and Evelyn, who never respected his own mother, instead of standing up for Imogen, rather undermines her with their son. The Greshams’ nearest neighbor is Blanche Silcox, a sturdy, tweed-wearing, country woman who fishes, and rides, and shoots, and drives a car. Blanche is someone of whom it is said that “the Chinese do not make many ugly carpets, but one of their very few had been unerringly chosen” by her. No one could be more different than Imogen, who is excessively feminine, and beautiful, and whose appreciation of beauty is intense. One reviewer said on Goodreads, “This is domestic fiction of the early 20th century at its best, but only for the most steely hearted.” I don’t consider myself entirely steely-hearted, and although I essentially read the book over the course of three evenings, sometimes fortified with Skittles, I had to take short breaks and read something else in between those evenings. Really it is a beautifully-written story. For me, it wasn’t beautiful writing in the sense that single sentences strike you almost with the force of a prose poem, something you’d want to write down and read over and over again, savoring the texture and the sound and the feeling of the words in your mind and maybe even saying them aloud. But the writing was beautiful: beautiful in its economy, its intelligence, and its sharpening to an almost painful clarity the emotions of a scene and the essence of each character. Did Evelyn ever really love Imogen? Does he love Blanche? Does he maybe love no one but himself? Knowing of Ms. Jenkins’s dislike of Virginia Woolf (and perhaps all of the Bloomsbury Group), did anyone else read the Leepers and Zenobia as possibly a critique of that set? If you’ve read the book, I hope you’ll weigh in with some thoughts! For my part, I would like to think the ending was on the happy side of indefinite, that most of all, there was hope for Imogen to achieve the happiness she tried to create for others. This entry was posted in Books, Reviews, and Reading and tagged books, Elizabeth Jenkins, The Tortoise and the Hare on April 21, 2013 by ms.grammarian.